600 years ago this month the battle of Agincourt was fought and won. What is less well known is that in the same year the Vicar’s hall was erected to be the communal eating place for the Priest Vicars. Prior to 1414 they had shared the Canons’ Cloister with the Canons. 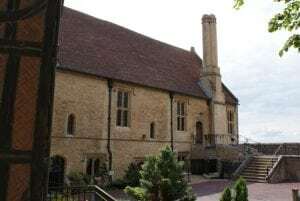 The Vicars’ Hall has had different functions over its 600 years; when it was just 25 years old the communal eating place was divided into four chambers. In the 1550s it became the home of the School Master of Grammar and School Master of Music. In the late 17th century it became the repository of all the books of the Chapter Library (now stored in secure and temperature controlled rooms in the Hall’s undercroft). 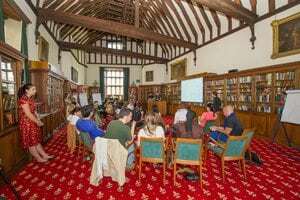 The Hall is now used on an almost daily basis by those attending consultations at St George’s House. Elsewhere on the website you can read about some of the Knights of the Garter, particularly Thomas Erpingham, who fought at Agincourt (click here).In the standoff of several hours that preceded the battle of King Henry drew up his army with Lord Camoys (made a Knight of the Garter one year after the battle) commanding the left wing and Edward, Duke of York (the King’s brother and a Knight of the Garter from age 14 ) the right wing. The King commanded the men in the centre. In between each of these sections and on the flanks were wedge shaped formations of archers. When the King gave the command for hostilities to commence, Erpingham threw his stick in the air and cried out nestrocque – interpreted as either now strike or knee, stretch. Arrows flew in their thousands. At this time the longbow was evidently superior to the crossbow, its range greater and the rate of fire better by a ratio of at least 6 to 1. 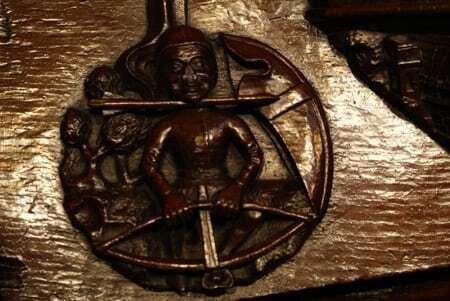 In the decades after Agincourt many improvements were made to the crossbow and it became a weapon to be much more greatly feared – perhaps it is for this reason that a man with his crossbow, a bolt and shield rather than a longbow are carved on one of the misericords in St George’s Chapel dating some 50 years after Agincourt. A few minutes after the archers had begun the battle Henry gave the command banners advance – men knelt, took a little earth into their mouths, stood then shouted St George repeatedly as they moved forwards. In addition to Garter Knights let us not forget that other band of men still with us today in the shape of the Military Knights of Windsor. Amongst those fighting on St Crispin’s day was one John Trebell who, about 15 years later was to become a Poor or Alms Knight – as the Military Knights were then known. Click here to read more about him.